The Christmas dinner table is the heart of the festivities. It’s where glasses are raised, crackers are pulled and an ungodly amount of pigs in blankets are eaten. So it seems only right that it should be dressed to impress. Use these Christmas table setting ideas for inspiration – and don't miss all our Christmas gifts and decorating ideas. There’s definitely something endearing about a Christmas table that’s got character. Mismatched plates, vintage trinkets and homemade decorations can all come together to create a lovely festive melange. So before you go buying anything new, take a look around your home and see if anything could be given a second home next to the cranberry sauce. We’ve talked a lot about bringing the outside in at Christmas, but it really is such an effective, inexpensive way to make a space feel immediately more festive. Try strewing your table with some branches, stems of eucalyptus and pine cones for an on-trend Nordic look. All Christmas tableware from George Home. If you are a sucker for traditional Christmas decorations, don’t limit all that red, green, gold and tartan just to the tree, incorporate them into your Christmas table settings, too. Start by dressing the table in a deep red tablecloth and then build up from there – holly, ivy, leftover baubles, tartan napkins – the whole shebang. Tableware and accessories from Talking Tables. Nostalgia plays such a huge part at Christmas, it explains why we are seeing a comeback of kitsch Christmas decorations. So why not have your turkey joined by a flamingo or the odd llama this year? Recreate this look by getting playful with pastel colours, confetti, sparkling stars and vintage baubles. Basically anything colourful goes. Because if you can’t have an overload of sparkle at Christmas then when can you? Mix rose gold metallics with blush-hued tableware and team with a simple table runner to recreate this look. (And pssst… that glimmering, golden branch running through the middle of the table, isn’t a painstaking DIY make, it’s actually a pre-lit garland from Lights4fun). Add an extra touch to your Christmas table by decorating your dining chair,s too. Tie ribbons around them, adorn them with mini wreaths or just simply hang a bough of fir off the back. It might not last long, but looks lovely for the big day, wouldn't you agree? Tableware, artificial trees and furniture by Neptune. 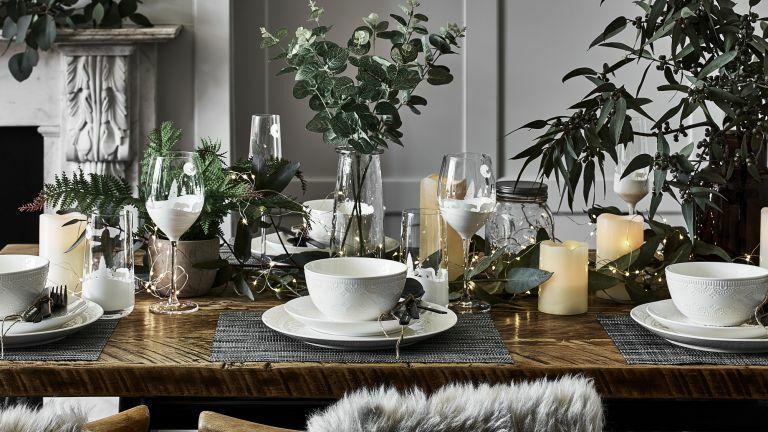 Not traditionally the most festive of colour schemes, black and greys may not scream Christmas cheer, but this table setting is just irresistibly gothic and, combined with the gold candles and plenty of foliage, we reckon it still looks plenty festive. Tableware and decorations from George Home. And if you just love a touch of Tim Burton, why not choose dark candles over the more traditional ivory tapers? As much as we love a crisp white table cloth, try using a linen one instead for a more casual Scandi vibe. Complete the look by throwing some fur rugs over your chairs and lacing the table with some greenery. Want more Scandi Christmas ideas? Check out more of our decorating ideas. Tableware and decorations by Neptune. Pay homage to the Victorian tradition of using food as decoration and make it the centrepiece of your Christmas table. Pick out some delectable looking fruit and pile it high in the middle of the table, then chose some vintage inspired tableware and dramatic tapers to complete the look. You just can’t go wrong if you have plenty of soft, glowing candles. And if you don’t trust your family to be around an open flame (especially after a few snowballs) these wax LED candles from Light4fun are incredibly realistic no one will even notice the difference (again, especially after a few snowballs). Not only does this ensure that you can be conveniently positioned at the opposite end of the table to whichever sloshed relative has had one too many bucks fizz, but place cards are also a really easy (and inexpensive) touch that shows you have made a bit of extra effort. You could of course have your place cards made (Not on the High Street have some lovely options), or you could copy this idea and get fancy with a calligraphy pen (or just a biro) and some nice heavy paper. For an alternative Christmas table try choosing a deep, velvety colour scheme – pair together shades of teal and plum and incorporate touches of rich fabrics for a really luxurious but cosy feel. This table setting might look expensive but everything is actually from Ikea! Give your roasties a more glamorous backdrop with some bold tableware. We love these zebra print plates from Maison du Monde; team them with some gold accessories, vintage-style glasses and printed napkins to recreate this look. Go rogue this Christmas and move away from the typical wintery blues, silvers and crisp whites and choose a warmer autumnal colour scheme. We love how the deep orange textiles look with the pillar candles, and how gorgeous is that Alpine throw from Neptune? Still very festive of course, just has a bit of a fresher feel. If you want to stick to a fairly neutral table but still want just a hint of cheery Christmas crimson, choose a few bits of tableware to lift an otherwise pretty restrained colour palette. These salt and pepper shakers from Le Creuset add a splash of colour and look gorgeous with the wintery blues and greys. We've seen a lot of debate about blue at Christmas; most of you seem to agree that blue just isn't a Christmas colour but we think paired with the right flourishes of foliage and touches of silver it can totally work. Pinch this idea and use rustic wooden placemats (something like these from John Lewis) and fur throws to soften the look.